Are there really It and Other? Or really no It and Other. 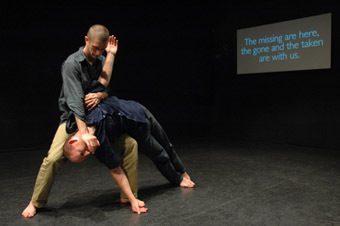 Two bodies, David Corbet and Jacob Lehrer, traverse the darkened space from separate sides of the room. There are qualities that reflect the dancers’ histories: the studios of Melbourne, London, Sydney and companies such as Strange Fruit, DV8, and Born in a Taxi. Their bodies are marked—and marked very well—by these practices, bullets marked by the calibre of the barrels through which they’ve been fired. Each performer dances within a certain aesthetic style I find I either like or do not. I find myself even wishing they would NOT dance certain things. And then suddenly the process lifts itself into a different qualitative place. The 2 bodies begin to merge and roll, intertwine and release—territory familiar from contact improvisation. Mellifluousness like honey takes over. The question of who is one or the other loses grip and for me, the real performance begins: like the eye circling a Mobius strip, they and I become both without and within. The best of contact improvisation always teases at this fabric. Within such intimacy, who can draw the distinction between acted, or acted-upon? This is as complex a relationship as that between foot and earth, mother and child, mouth with atmosphere. One dancer leans into, shares skin with another; a dancer walks, talks, bounces off/with/in the room. In Excavate, Corbet walks sideways along the walls. He climbs up Lehrer’s body as if it were a mountain, or an elephant, or a set of steps. High-seated as a rajah, he blinds Lehrer with his hands and steers his face; yet Lehrer also self-directs, propelling the double-bodied monster into the audience. A masterful moment: threatened with collision, my own body merges with the event. Have we all together, in watching, playing, dancing, been becoming a new beast, a new consciousness, from the very first steps? My responses thence become twofold. I marvel at the elasticity and liberties their process allows, but also wonder at the restrictions that arise within the distinct narratives that emerge. There’s plenty of “men’s business”: noir fights, jamming fists, back-alley brawls. And just look at the publicity stills! Bam, Smash. Pow. But what troubles me is not the violence, but what inhibits their investigation during these actions. I feel the world go small. It’s quite reasonable to argue that clear narrative markers are necessary to link an audience to a work—ah, now I know where I am, even if only for a moment. But in these very moments, the hard edges become somewhat static. For instance, where do these men’s hands go and not go. What and how do they touch, and not touch. What is more violent than completing a violent action. What multitude of qualities, dialogues and choices is in those hands before they smash the other player into the wall? Reality is more complex than this. After the performance, when I ask “What stops you there [from going further, from going elsewhere]?” Corbet looks deeply thoughtful, but at the time can’t find words to respond. In Melbourne in the early 1990s, I remember seeing Libby Dempster’s Whisper Corraggio—a piece about political incarceration—and whilst there wasn’t a rough hand laid on anyone, nonetheless one left the theatre devastated. Of course, this is a different piece. But I wonder what other tendernesses, irritations, teasings there might have been, within the very enactments of the violence. I am thinking also of how the room itself might respond: in this performance, we sometimes have the performance environment (walls, spatial dimensions, projection, sound) acknowledged as animate and co-creative, but often not. Lehrer responds with an obvious answer that of course they wouldn’t go so far as to smash each other’s brains. A fair response, but, frankly, nobody’s been fooled; and interestingly, on the night I attended, un-dance-educated members of the audience knew that was not the question. The partial reality Corbet and Lehrer smash into when they dig does carry its own beauty and risk. And movement between fluidity and edges, expansion and stasis, is perhaps inevitable. But perhaps too, at this stage in their prolific creative partnership, the “next thing” might rest in further un-limiting their questions.